The Parametric Equalizer block has been replaced by the Parametric EQ Filter block. Existing instances of the Parametric Equalizer block will continue to operate. For new models, use the Parametric EQ Filter block. This block brings the filter design capabilities of the filterBuilder function to the Simulink® environment. See Parametric Equalizer Filter Design — Main Pane for more information about the parameters of this block. The Data Types and Code Generation panes are not available for blocks in the DSP System Toolbox™ Filter Designs library. Parameters of this block that do not change filter order or structure are tunable. Magnitude response, phase response, and group delay in the frequency domain. Impulse response and step response in the time domain. The tool also helps you evaluate filter performance by providing information about filter order, stability, and phase linearity. For more information on FVTool, see the Signal Processing Toolbox documentation. Specify the filter order. This parameter is enabled only if the Order mode is set to Specify. Depending on the filter order, the possible frequency constraints change. Once you choose the frequency constraints, the input boxes in this area change to reflect the selection. Select the frequency units from the available drop down list (Normalized, Hz, kHz, MHz, GHz). If Normalized is selected, then the Input Fs box is disabled for input. Enter the input sampling frequency. This input box is disabled for input if Normalized is selected in the Frequency units input box. Enter the center frequency in the units specified by the value in Frequency units. The bandwidth determines the frequency points at which the filter magnitude is attenuated by the value specified as the Bandwidth gain in the Gain specifications section. By default, the Bandwidth gain defaults to db(sqrt(.5)), or –3 dB relative to the center frequency. The Bandwidth property only applies when the Frequency constraints are: Center frequency, bandwidth, passband width, Center frequency, bandwidth, stopband width, or Center frequency, bandwidth. The passband width determines the frequency points at which the filter magnitude is attenuated by the value specified as the Passband gain in the Gain specifications section. This option is enabled only if the filter is of minimum order, and the frequency constraint selected is Center frequency, bandwidth, passband width. The stopband width determines the frequency points at which the filter magnitude is attenuated by the value specified as the Stopband gain in the Gain specifications section. 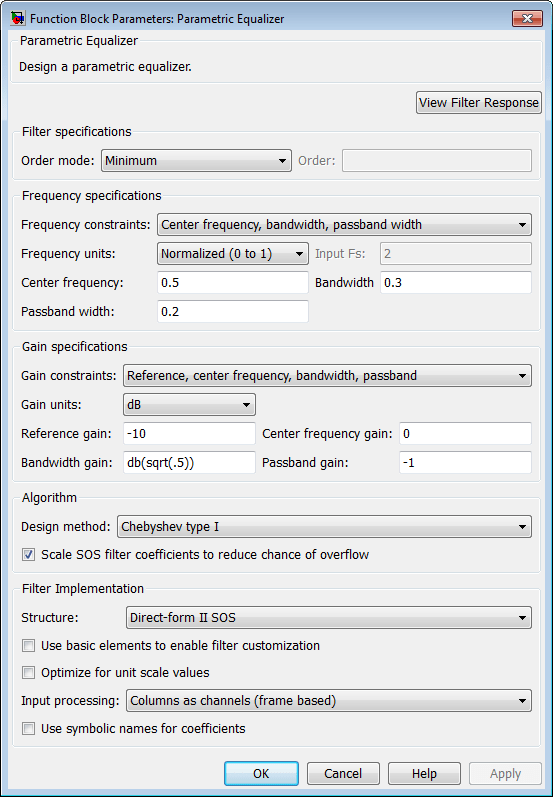 This option is enabled only if the filter is of minimum order, and the frequency constraint selected is Center frequency, bandwidth, stopband width. Enter the low frequency cutoff. This option is enabled only if the filter order is user specified and the frequency constraint selected is Low frequency, high frequency. The filter magnitude is attenuated by the amount specified in Bandwidth gain. Enter the high frequency cutoff. This option is enabled only if the filter order is user specified and the frequency constraint selected is Low frequency, high frequency. The filter magnitude is attenuated by the amount specified in Bandwidth gain. Depending on the filter order and frequency constraints, the possible gain constraints change. Also, once you choose the gain constraints the input boxes in this area change to reflect the selection. Specify the gain units either dB or squared. These units are used for all gain specifications in the dialog box. The reference gain determines the level to which the filter magnitude attenuates in Gain units. The reference gain is a floor gain for the filter magnitude response. For example, you may use the reference gain together with the Center frequency gain to leave certain frequencies unattenuated (reference gain of 0 dB) while boosting other frequencies. Specifies the gain in Gain units at which the bandwidth is defined. This property applies only when the Frequency constraints specification contains a bandwidth parameter, or is Low frequency, high frequency. The passband gain determines the level in Gain units at which the passband is defined. The passband is determined either by the Passband width value, or the Low frequency and High frequency values in the Frequency specifications section. The stopband gain is the level in Gain units at which the stopband is defined. This property applies only when the Order mode is minimum and the Frequency constraints are Center frequency, bandwidth, stopband width. The boost/cut gain applies only when the designing a shelving filter. Shelving filters include the Shelf type parameter in the Frequency constraints specification. The gain in the passband of the shelving filter is increased by Boost/cut gain dB from a floor gain of 0 dB. Select the design method from the drop-down list. Different methods are available depending on the chosen filter constraints. Select the check box to scale the filter coefficients. Select this check box to implement the filter as a subsystem of basic Simulink blocks. Clear the check box to implement the filter as a high-level subsystem. By default, this check box is cleared. Optimize for zero gains — Terminate chains that contain Gain blocks with a gain of zero. Optimize for unit gains — Remove Gain blocks that scale by a factor of one. Optimize for delay chains — Substitute delay chains made up of n unit delays with a single delay by n.
Optimize for negative gains — Use subtraction in Sum blocks instead of negative gains in Gain blocks. Select this check box to scale unit gains between sections in SOS filters. This parameter is available only for SOS filters. Columns as channels (frame based) — When you select this option, the block treats each column of the input as a separate channel. Elements as channels (sample based) — When you select this option, the block treats each element of the input as a separate channel. The Inherited (this choice will be removed — see release notes) option will be removed in a future release. See Frame-Based Processing in the DSP System Toolbox Release Notes for more information. Enforce single-rate processing — When you select this option, the block maintains the sample rate of the input. Allow multirate processing — When you select this option, the block adjusts the rate at the output to accommodate an increased or reduced number of samples. To select this option, you must set the Input processing parameter to Elements as channels (sample based). Select this check box to enable the specification of coefficients using MATLAB® variables. The available coefficient names differ depending on the filter structure. Using symbolic names allows tuning of filter coefficients in generated code. By default, this check box is cleared.